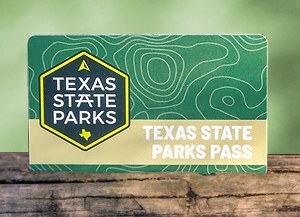 A Texas State Parks Pass costs $70 and is issued to one person (the card holder). You can buy a second pass for someone who lives at the same address as you for $25. For more information, read Texas State Parks Pass Details. Buy a Texas State Park Pass on our reservation website or at any state park, or call (512) 389-8900 to order a pass (plus shipping and handling). Secondary passes can only be purchased at a park. Obtain these passes at any state park. If you are 65 years old or older and are a Texas resident, you qualify for the Senior Partial passport good at Texas state parks that charge entry fees. With this pass, you pay 50 percent off the entry fee rounded to the next whole dollar. For example, if the entry fee is $3, you will pay $2. The pass holder may extend this same benefit to one additional person to assist them. Other papers that confirm your age, identity and home address. If you were born before Sept. 1, 1930, you qualify for the Senior Full passport. 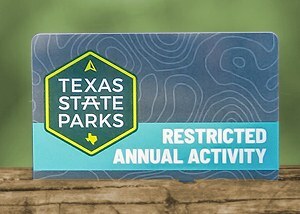 With this pass, you can enter any Texas state park for free. One additional person may assist the pass holder at a reduced rate of 50% of the standard entry fee. Other papers that confirm your age and identity. 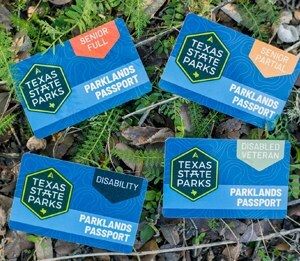 The Veterans passport allows free entry to Texas state parks for U.S. veterans with a 60 percent or more service-connected disability or loss of lower extremity. One additional person may assist the pass holder at a reduced rate of 50% of the standard entry fee. Tax exemption letter for Texas veterans. 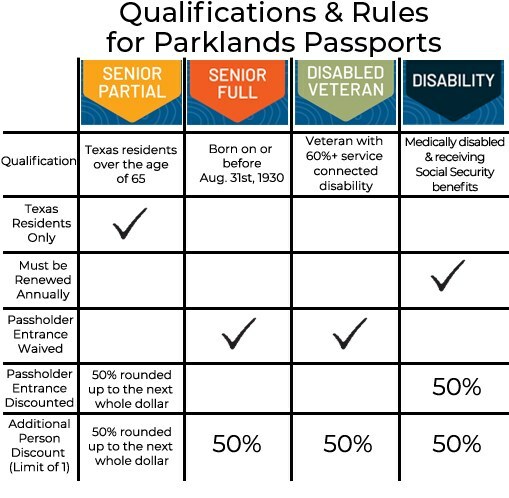 If you are medically disabled and receive Social Security benefits, you qualify for the Disability passport, good at Texas state parks that charge entry fees. With this pass, you pay 50 percent off the entry fee. The passholder may extend this same benefit to one additional person to assist them. An Award of Benefits Letter or a Statement of Benefits from the Social Security Administration which says that you are permanently disabled. 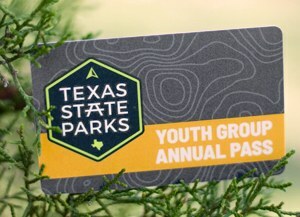 The Youth Group Annual Pass allows free entry to state parks for nonprofit youth group members and a reasonable number of adult sponsors. The pass costs $100 and is valid for one year. Up to a total of 50 kids and sponsors can enter the park with the pass. To purchase, you must show proof of nonprofit status and certify that your group serves children ages 13 to 17. We must receive all application documents at least six weeks before your next park visit so that we have time to process and mail your pass. If you do not present the pass when you check in, the park staff will have to charge you standard entrance fees. Parks will not accept a sales receipt in lieu of the pass. Some parks issue passes that give access to specific things like swimming or golfing. These passes grant entry to the park only for specific activities. You will have to pay entry fees to use other park facilities. Rules, terms and applications vary; please contact parks for details. Purchase gift cards for any value between $5 and $500. 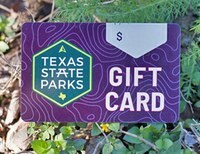 You can buy gift cards online or at a state park. Redeem gift cards at most state parks to purchase park passes, retail items, or to pay for park entrance or overnight fees. Gift cards are fully transferable and must be treated like cash. Funds on gift cards expire three years from purchase.